Gaja is one of the stars of the wine world, a producer that is widely credited with transforming not just the image and international reputation of its native Piedmont region, but of Italy as a whole. It is one of the few brands that can compete with and charge the same prices as the top names of Burgundy and Bordeaux. Why? Because the wines are that good. 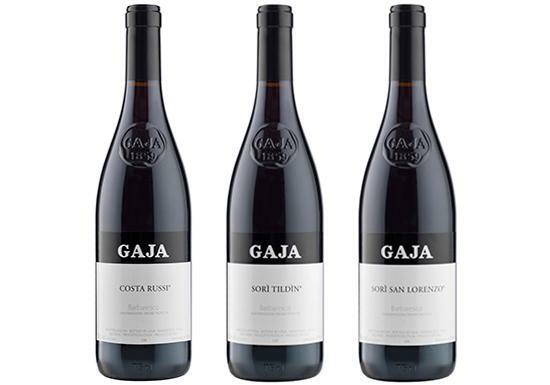 The Gaja family is wine royalty in every sense. Now in the fifth generation, Gaja still produces some of the most iconic and memorable wines coming out of Italy. And now you have a chance to order your taste of history. Please note that these wines really need some bottle aging and should be cellared any where from 2-10 years for optimum enjoyment. The Barbaresco is simply gorgeous and just exudes class from the very first taste. The wine’s depth and overall harmony really carry it with exotic aromatics and hints of orange peel, spice and rosewater. The wine will prove hard to resist, but we suggest keeping this gem in the cellar for a few years to fully unwind. The Costa Russi is once again a striking wine with tremendous energy and lots of potential. The 2015 shows the suave mid-palate and raciness that is so typical of this wine with a nose of strawberries and flowers. Fully body with fine, dusty tannins and long, beautiful finish. Drink in 2020. This wine is all about harmony and strength with dense and compact layers full of black fruit and black truffle. This growing site always produces robust and opulent wines, but the wine graciously offers enough acidity to achieve balance and remind you of its pedigree. The wine will reach the start of its drinking window within the next decade. Sori San Lorenzo is endowed with some serious concentration and power with mesmerizing aromas of sandalwood, cedar, roses and dried strawberries. Full-bodied, tight with lots of pretty and ultra-fine yet powerful tannins. The wine really needs some bottle aging to find its “sweet spot.” Incredibly complex with loads of minerality and a finish that seems to go on for minutes.